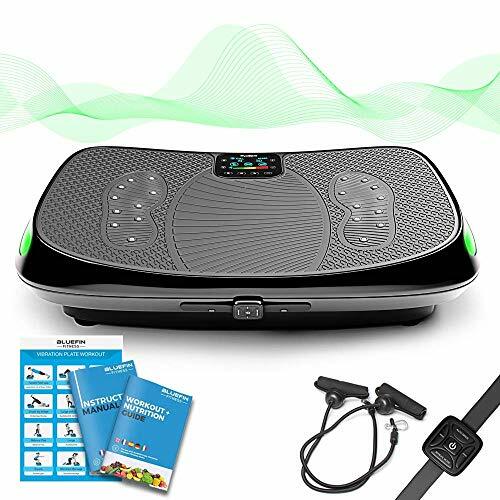 Bluefin Fitness 4D Triple Motor Vibration Plate | Powerful | Magnetic Therapy Massage | Curved Surface | 4.0 Bluetooth Speakers | Vibration Oscillation & Micro Vibration | 3 Silent Drive Motors by Bluefin Fitness at Sweat NY. Hurry! Limited time offer. Offer valid only while supplies last. Powerful 4D motion + soothing magnetic therapy in one high quality, user friendly package for the ultimate home gym experience at any ability level. View More In Vibration Platform Machines - Page 3. Powerful 4D motion + soothing magnetic therapy in one high quality, user friendly package for the ultimate home gym experience at any ability level. The most advanced technology on the market - 3 separate silent drive motors produce more intensity and greater range of motion than any other plate to keep your body guessing. Full body workouts in just 10 mins from the most cutting edge plate available. Benefit from powerful vibration, oscillation and micro vibrations up to 50 Hz! Curved face plate provides max contact so your body absorbs maximum vibration benefits. Comfortable surface gives soft grip & traction for bare feet or shoes. Ideal for seated use as well if you'd like a massage or prone workout option. All ability levels will enjoy the wider stance this plate affords making balance and stability safer and easier than ever before. Never have a boring workout! All exercise settings designed by vibration fitness experts to challenge your body and provide short workouts optimized for full body challenge. 3 manual settings and 7 programmed options to choose from in addition to control over speed and intensity. Unrivalled customization for near limitless exercise options. Loads of accessories to help you reach your full body fitness and well being goals. Play your favorite music from high quality bluetooth speakers while you enjoy exercise and massage from any room in your home. Use the sturdy foam mat to absorb sound and pad flooring, perfect for people who live in apartments. Bluefin's workout poster can be used in conjunction with included exercise cables so that no body part is included in your workout. Our diet and nutrition guide is a great accompaniment to your healthy lifestyle, refer to it for tasty recipes and tips on how to make the most of vibration training. Add 4D to your cart today & enjoy a lifetime of home fitness & relaxation! 4D Motion: 3 silent drive motors deliver Vibration, Oscillation and Micro Vibration, separately, together, or all three at the same time! Bluefin's 4D vibration plate gives you a workout like no other. Magnetic Therapy Sensors: Enjoy reflexology like massage mid workout or while seated. Stimulate blood flow and soothe tired feet and legs. Generous curved surface provides maximum contact, comfort & safe, non-skid surface. Intuitive LED Stop Light System : Ultra bright LEDs tell you how intensely you're working with Red, Orange and Green. Check your fitness progress with a glance. Loads of intelligent workout Options: 3 carefully designed program options and 7 challenging manual combinations for great variety. Just 10 minutes is sufficient for a full 4D workout. Cutting Edge User Friendly Technology: Bluetooth 4.0 speakers for crisp & clear sound, ergonomic + wearable remote control, easy to use control panel & settings keep your body challenged without confusing you.